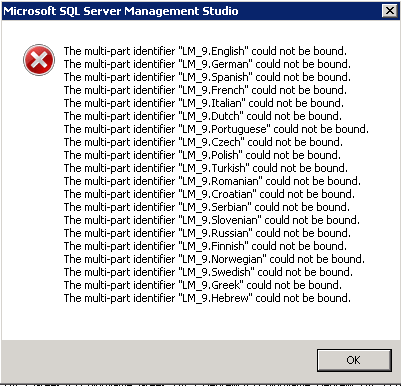 This Error Message Article explains the Microsoft SQL Management Studio error message “The multi-part identifier “[select field]” could not be bound.” and details how to fix the underlying problem that caused it to appear. SQL cannot find the field in the FROM part of the SQL statement called out for in the Select statement. In this case, a typo in the FROM statement, INNER JOIN for [select field #1] said [select field #2], caused the SELECT to fail. Great care needs to be taken in writing SQL statements. Tagged: Microsoft SQL Server Management Studio ErrorSQL statement errorThe multi-part identifier "[select field]" could not be bound.